There's a bit of an echo here...after not posting for so long. ;-) I did not have much inspiration or drive to work on miniatures or post anything lately. Which doesn't mean I didn't do anything at all. The past few weeks I tried to do a little inlay work. I had done a bit of inlay before, about 8 years ago in a class by Barry Hipwell. I must confess I couldn't quite remember how we did it. At that time I didn't realize I had to write everything down so I wouldn't forget how it was done. After a bit of trying I figured out how to do the inlay again, or something which worked for me anyway. I used a tray by Émile Gallé for inspiration. I did make a few mistakes and I'm not happy with the entire design (there were some odd design choices by the great Gallé in my opinion), but I decided to finish it anyway, just for the learning experience. It was a LOT of work and I spent a lot of time on hands and knees looking for yet another piece I had dropped (great fun looking for a piece of wood on a wooden floor), but I did enjoy it. 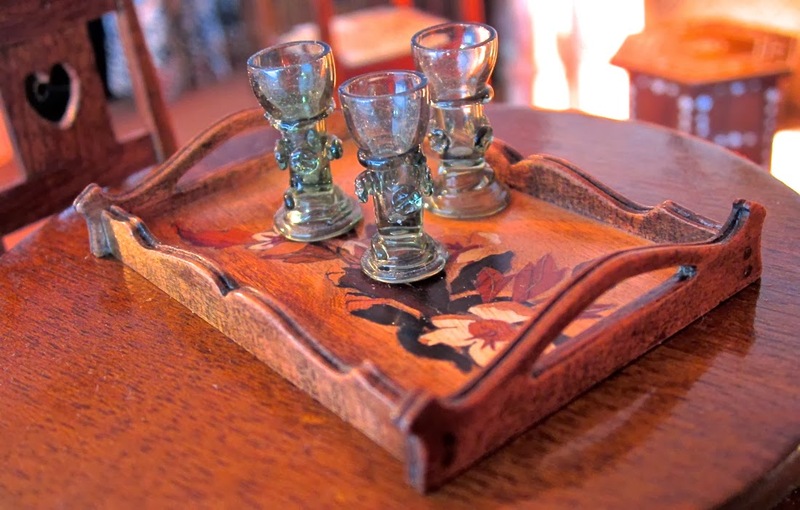 I learned a lot from making this little tray and I have already found another piece I would like to try and make next. Now I do need more veneer! The sides of the tray are made with pear wood, into which I carved a centre line. I finished the tray with shellac and wax. It looks lovely and smooth! Although I made the tray just as an inlay exercise and not with a specific room in mind, it looks quite at home in this Arts & Crafts room in my Canal House. 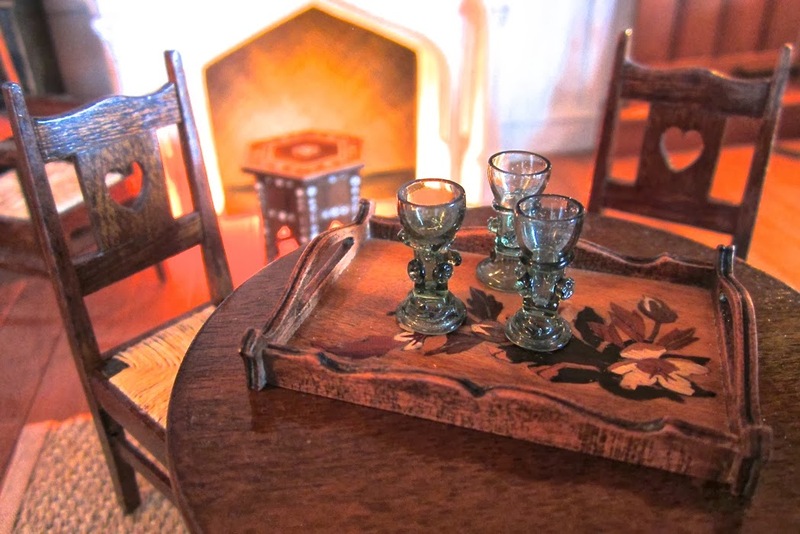 The curved edge of the tray is repeated in the curved back of the chairs. Also for this room I made a cute Arts & Crafts inspired light fixture. I used an old metal brooch, a bit of brass tubing, a glass shade and a light bulb from Lighting Bug. Sorry for the poor quality of the photo, but lighting conditions were bad lately. Even though the lamp is a bit cobbled together, I really like it. 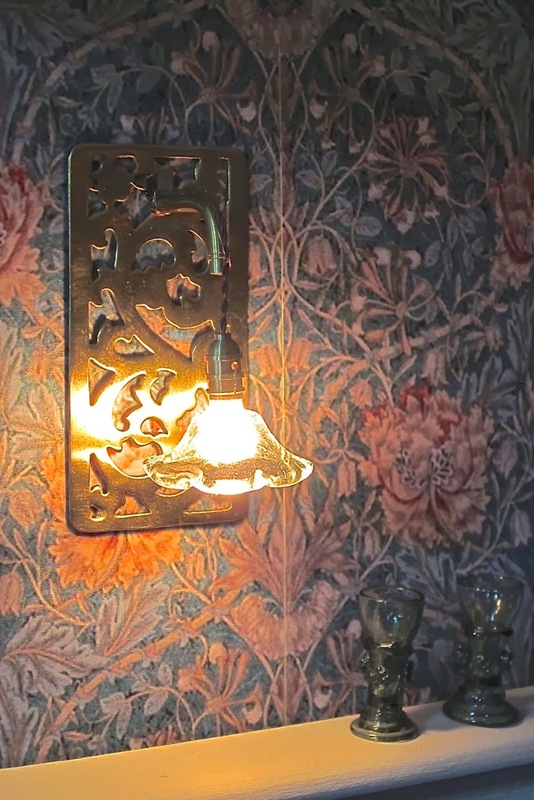 The lamp reminds me of the ones in Standen, an Arts & Crafts house with Morris &Co. interiors in West Sussex, UK. As you may know by now, I love the Arts & Crafts movement! personnellement je n'aime pas la marqueterie en miniature alors que j'aime beaucoup celle ci sur certains meubles à l'echelle 1.je pense que c'est du à la taille du motif . C'est la première fois que j'aime une réalisation en miniature. je trouve que le modèle que vous avez choisi va parfaitement avec la forme du plateau . on retrouve les courbes des fleurs dans les courbes des cotés du plateau. les couleurs du placages sont des couleurs très automnales . je ne connais pas du tout cette technique en miniature. c'est une jolie réussite. j'aime votre applique car c'est une pièce unique. elle s'adapte très bien à votre intérieur. dans la vraie vie nous avons tous des luminaires qui ne sont pas des répliques de styles. ils ont leur histoires, et donnent à nos pièce beaucoup de charme.merci de me faire découvrir le style Arts&crafts.C'est très éloigné de ce qui me touche. je suis fascinée par le style napoléon III, pour le coté trés féminin,je pense. Ah Catherine, I like that you're not afraid to say when you don't like something! And so it is a very big compliment to hear that you do like my little tray. With it's faults and all. I quite like the autumnal colors myself, even though some wood choices were not the best in hindsight. Like I said, I need more veneer! I will try my hand at more pieces though, as I enjoyed it. As for the Arts& Crafts movement, for some reason I have always been drawn to the designs of Morris and his friends. Perhaps it is honest use of materials I like, or the comfort and coziness the A&C houses exude…Compared to the Napoleon lll style, it is much more masculine. I like both! Thank you. Well basically it is cutting out a veneer pattern piece, cutting a hole into which the piece of veneer fits and glueing it into place. Ha! That sounds easier than it is. I watched many videos on YouTube before I started, some have a different technique which is not really useful for miniature work. And the rest I just made up as I went along. As I said, I did make a few mistakes, but that's normal. We all get better with practice. 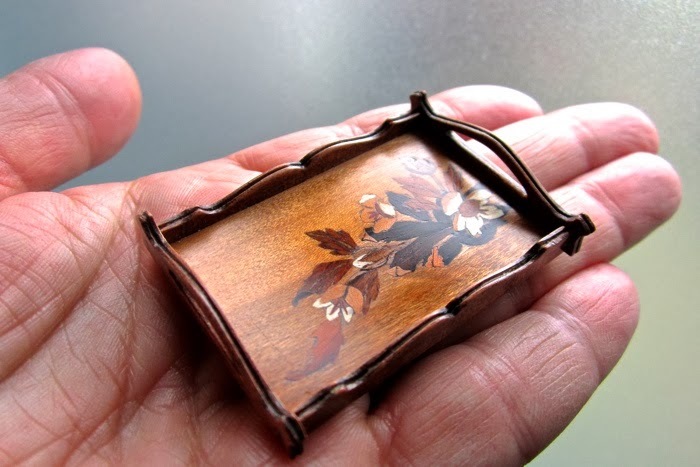 Oh Josje, Your inlay work is amazing! And to think you had forgotten how! (It doesn't show!) It is one of the skills I admire and have yet to try... I am still stuck in the Middle Ages I guess, LOL! As for the lamp you made, it is Fantastic! 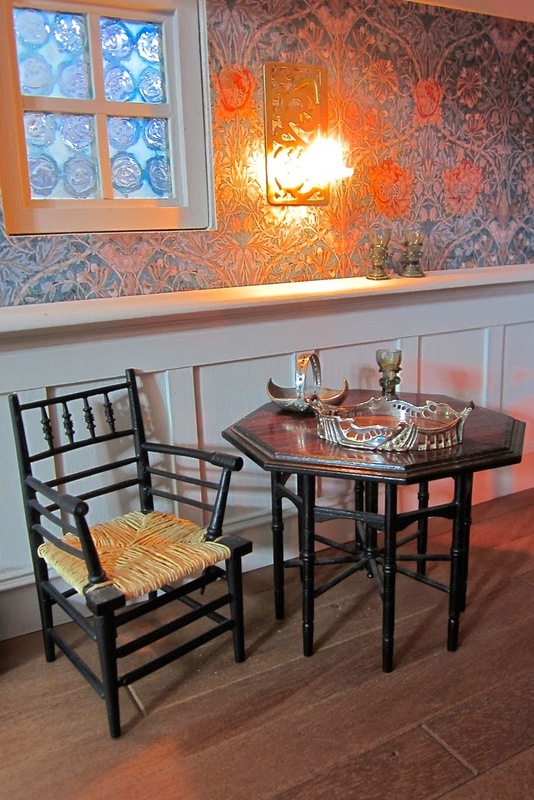 We forget that electric lights were the newest technology in the nineteenth century! Your assemblage of parts looks very authentic! I always love to see what you are making! Thank you Betsy! Yes I did forget a lot of it… but watching some videos on YouTube did help. Although there was something Barry told us about the angle of the knife I still can't remember. I just tend to make it up as I go along, so I learn from my mistakes while working on it. I know I did some things differently from what I was taught 8 years ago, but it worked for me so I used it. Yes we do forget electricity was the cutting edge of technology back then, you are so right! Must have been exciting to work on for the artists back then. Wow! 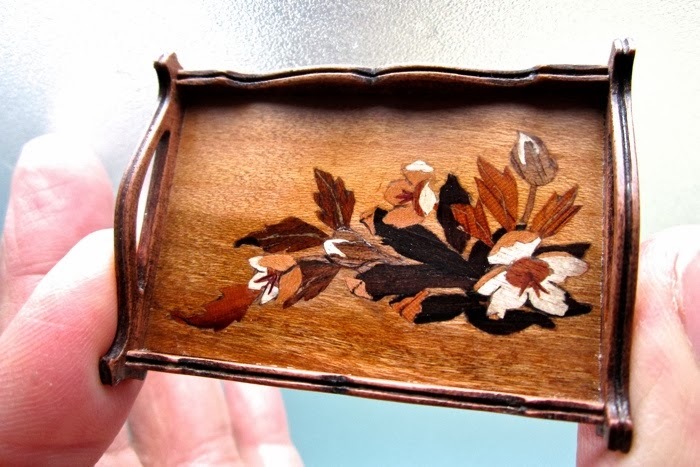 This is a wonderful inlaid tray! I have never seen such a tiny! Hi Josje! I think your tray looks absolutely gorgeous!! There's no way I would have known you made mistakes, it's a real work of art! It's the same with the lamp, you say you cobbled it together but it all comes together beautifully. I think it looks perfect! If this is what you come up with when you haven't got much inspiration, the world better watch out when you really get going!! Una verdadera obra de arte!! Fijn om weer iets van je te mogen lezen en zien. Prachtig dienblad en de lamp is ook super. Ik hou zelf enorm van art deco, dus dit vind ik echt genieten om te zien. Ja het heeft even geduurd maar ik ben er weer ;-) Mooie periode Art Nouveau en Art Deco. Je ziet er niet zoveel van maar ik heb het idee dat het wel wat populairder aan het worden is. Het wordt zeker wat populairder in de miniaturenwereld, Emily Art en Phoenix hebben wat mooie Art Deco beeldjes en ook de meubels zie je steeds vaker, leuk zo divers al die stijlen en wij kunnen nog jaren vooruit haha. WOW Josje! The tray is beautiful. I love the design too. It appears you forgot nothing about what you learned in your class. There is a similar technique in metal work. It is called marriage of metals. All the puzzle pieces of different colors of metal are soldered together. Once that has been done the surface is sanded and polished. It then look like a solid sheet. I have used it many times on a variety of things. Wow, in metal it seems to me to be even more difficult that in wood. Especially with the soldering (I'm not good at that at all). I can envision the metal version though, that should be beautiful! Thank you Anna! I'm glad you joined me. Mind blown by that tray, Josje. How can you people make such immaculate perfection?! Especially in such a size??! Insane. A lovely tray and lamp! You are so very creative and are always making such gorgeous pieces. Thanks for sharing this! You're welcome Lucille! Thank you for your compliment! Je hebt weer een prachtig kunstwerkje gemaakt Josje. Heel bijzonder miniatuurtje. Yes I agree, the design does look a bit like pressed flowers! Thank you Pepper. What a great job ! 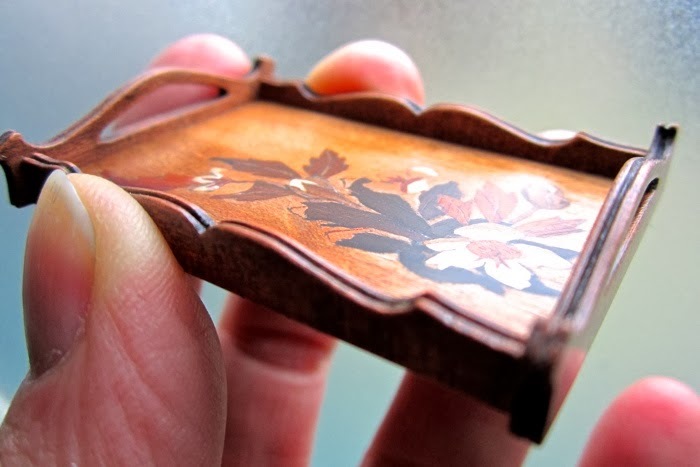 I am not a great fan inlay work (in 1/1 scale or in 1/12) but I must admit it is fascinating to see so many small intricate shapes mixed together to figure a bunch of flowers. And you've done it with maestria ! What a wonderful tray! I love the colour combination you used. And the bit about 'looking for a piece of wood on a wooden floor' made me laugh.... this has happened to me so many times before - or try looking for a small piece of wood in a pile of sawdust, that's even more fun, hahaha. I can't wait to see another one of your masterpieces! Thank you Illyria! Yes the wood I used for the sides is steamed pear. It is dark because I stained it before finishing it with the shellac. You're right that the shellac itself doesn't make the wood much darker, it just deepens the colour. Gorgeous tray, Josje! It looks so much like a real antique inlaid tray (and I love the curvy sides). Wow! the tray is just wonderful. I cannot even imagine the work that went into it. It is lovely and so welldone. The lighting fixture is also beautiful! It's great to have a new post and see what you have been up to. Hi Giac, I should have posted more but there's not much to tell ;-) Thanks! Je hebt echt een schitterend dienblad gemaakt. Tja daar moet ik ook maar eens voor in de leer. Jammer dat Barry niet meer leeft, ik heb gehoord dat hijzelf fenomenaal kon inleggen. Je kamer is heel erg leuk. Ach Alexandra, ja Barry's werk is onnavolgbaar! Er zijn weinig foto's te vinden van zijn werk op internet helaas. Wat mij altijd het meest gefascineerd heeft is zijn miniatuur versie van de Gubbio Studiolo . De full sized versie is te bewonderen in het Met NY, Barry's miniatuur versie staat in the Nationaal museum of toys and miniatures in Kansas, USA. I'm a late...I know...I didn't see your post. The work you did with this tray is really great. It's possible that we don't have here the best design made by Gallé, but still...it's a great work and a very beautiful Art Nouveau tray. Your Arts and Crafts room was the good choice for such a tray. I already changed the design a bit but of course I made mistakes as well where obviously Gallé's version was better...;-) It's all part of the journey of learning. That's very kind of you to say Susan, thank you! Prachtig, zowel het dienblad als de lamp. Je suis en admiration, ce plateau est vraiment magnifique ! Le dégradé de couleur est superbe tout comme le dessin, et le rendu sur la table avec les verres, c'est parfait ! Je n'ose pas imaginer le travail de fourmi avec les minuscules bouts de bois. Les chaises avec le dossier en coeur sont très jolies et forment un bel accord avec les courbes du plateau. Un vrai plaisir pour les yeux ! Merci pour le compliment Marie! Oh Josje!! You certainly made up for your mini absence! The tray is amazing! Well done, you're so clever. What beautiful things you have, I particularly liked the silver basket. The wallpaper too is lovely. For a little test piece you've made a marvellous job of it and it fits very well into your Canal House decor. Thanks Irene! I feel more confident trying another piece now that I've made this and know where I've gone wrong. Wat ben je toch een kunstenaar. !!!! wow! wat prachtig dat inlegwerk...super mooi gedaan. wow! wat mooi dat inlegwerk, echt supermooi gemaakt. De lamp is ook mooi. Hi Josje, Nice to see you back in the mini groove. I am jsut back from meandering about NZ and looking for inspiration. The garden has taken my attention as the soil in the vegetable beds can now be worked. Good work on the little tray and yes, it does work nicely on the table and echos the shape of the chair backs. Always love to see what you are doing. Hi Josje, I know a bit late but it really looks amazing your tray.